Ian Strang graduated from California State University Long Beach with a Bachelor's degree in Communications. Ian went out into the world with his useless degree and tried to make something of himself. He found his way to a tiny mining village called Los Angeles, California where he worked odd jobs for several years until he ended up in Hollywood where he continued to work odd jobs. At this point Ian was wondering if 6 and a half years of state college was worth it. He has written and illustrated several books including: The Angerman Chronicles, Poop Tacos and The Men's Room Etiquette Book. He has also written two novels, The Grand Scheme of Things and the sequel The Infinite Blue Yonder. He is currently working on a third novel. Ian lives in Los Angeles with his wife and daughter and a hill full of ground squirrels that are currently devastating his yard. 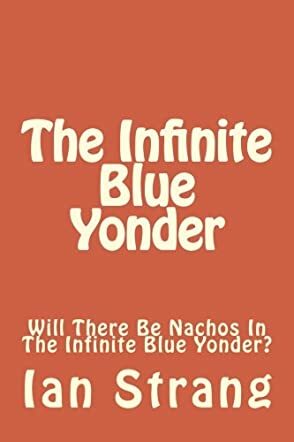 In The Infinite Blue Yonder by Ian Strang, Earth is in serious trouble; it has been taken over by squirrels because humans have become intellectually lazy and pampered. Humans now languish in wildlife parks and zoos. Now the most successful author in the universe, Bill Friday is called in by Bessie, who runs the most popular reality show about humans. They have just one week to reverse the destruction of the human race and get Bill’s story back on track, or the show will be cancelled. A Canadian Sasquatch called Flex is sent to find the iRobot engineer, Dudley, who created the Roomba with artificial intelligence, and replace their motherboards. If they fail, Earth is doomed and will be sold to an alien corporation. If you enjoy a great story with plenty of suspense, action and laughter, then this is the perfect novel for you. The characters are like no others I have come across. A giant squirrel who enjoys robbing banks and has a phobia of clowns, a Canadian Sasquatch, and the weird and wonderful Bill Friday. The quick-witted dialogue has many laugh out loud moments and, although the plot about squirrels taking over the earth is quite bizarre, I genuinely became engrossed in the plot and wanted Bill, Bessie and Maynard the squirrel to succeed. I loved every unique character and the fast pace of the story made it really engaging. Just when I thought they were close to succeeding, there was yet another obstacle to overcome. The philosophical quotes from Sunshine Jarboly were a great addition to each chapter too. The author has an amazing imagination and creative writing ability to bring such a brilliant story to life.